Posted: Mon Aug 06, 2018 8:30 am Post subject: Where is Volkstock? The gates are open @ 12:00 noon on Friday - 8/10. I'm excited about this weekend. Please save me a bed, couch, or floorspace. I'll bring an easy-up, & I'll be driving the 63 Beetle. I did not get a transaxle ordered for it though. I spent the money on a vacation instead. Kellie will not be making an appearance this year. She'll be in New Orleans. Lake Jim said he was coming up Saturday. No more sleeping accommodations "inside" available at this time other than the MAIN COUCH. If you are coming and have no room assigned below.....you need to bring your own ROOM - LOL! Posted: Thu Aug 09, 2018 1:38 pm Post subject: Steve Easy Up + 2 from me available!! I have 2 new easy ups also, so we have 3 available for the weekend now. Posted: Fri Aug 10, 2018 6:55 am Post subject: The time is near! Welcome everyone to the 1st day of Volkstock! Reminder that gates will be open at 12 noon. Can't wait for all of you to leave work early in order to get this event started!! Safe Travels to all. Pizza, chips and Salad tonight!!!!!!!!! I am soooo ready. We will arrive early afternoon. 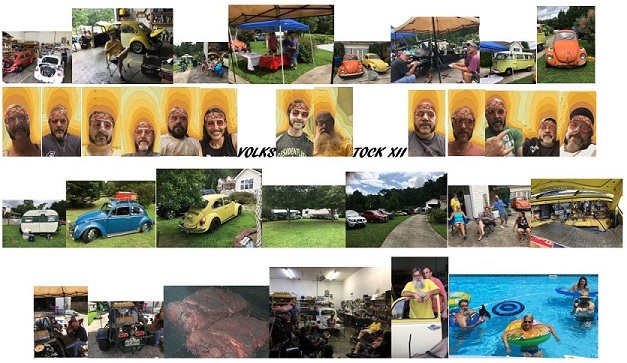 Posted: Sun Aug 12, 2018 3:58 pm Post subject: Another VOLKSTOCK in the books!! SHOUT OUT to JEFF EPPERSON for providing the RIBS-N-PULLED PORK. "Frickin Out of this World!!" Looking forward to Volkstock XIII, but it is nap time now! Hope you had a nice time everyone! Thanks Ken and Inge! Another awesome Volkstock made possible by the best hosts ever! Posted: Fri Aug 17, 2018 3:29 pm Post subject: It's FRIDAY....Where is everyone at????? It's FRIDAY and no one is here...........Oh VOLKSTOCK was last weekend!